Kamari Burnside scored five points in the final 1:30, and his alley-oop to Desert Oasis teammate Jacob Heese with 11 seconds to play sealed the Sunset Region’s 115-110 win over the Sunrise. Playing with a new set of players can sometimes be difficult. So Desert Oasis teammates Kamari Burnisde and Jacob Heese used their familiarity down the stretch during the senior all-star game at Foothill on Wednesday. Burnside scored five points in the final 1:30, and his alley-oop to Heese with 11 seconds to play sealed the Sunset Region’s 115-110 win over the Sunrise. Burnside’s 3-pointer with 1:09 left broke a 107-107 tie, and the Sunset wouldn’t trail again. Tieman Allen of Palo Verde added a 3-pointer to push the lead to 113-107. Foothill’s Marvin Coleman hit his fourth 3-pointer of the second half to make it 113-110, but he missed a pull-up 3-pointer after a steal, and Burnside’s alley-oop to Heese put the game out of reach. Heese had 20 points and five assists, including seven dunks. 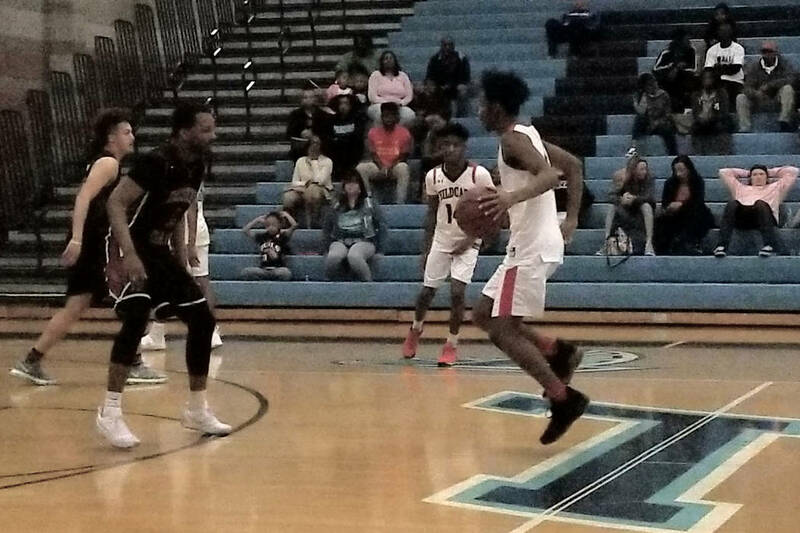 Burnside added 13 points, five rebounds and seven assists, and Cimarron-Memorial’s Brian Washington had 22 points, five rebounds and three assists for the Sunset. Washington and Heese put on a dunking show, combining for 16 slams. Burnside said ending his senior year with a win, even in a game that didn’t feature much defense, was special. Liberty’s Cameron Burist paced the Sunrise with 23 points. Taieem Comeaux of Coronado added 21 points and six rebounds, and twin brother Tahj had 16 points and five rebounds. Coleman had 18 points and six boards for the Sunrise. SUNSET: Brian Washington 22, Jacob Heese 20, Tieman Allen 16, Kamari Burnside 13, Elijah Kothe 13, Manny Mitchell 10, Jaylen Fox 6, D’Eric Marlowe 6, Chase Hafen 4, Cristian Pitts 3, George Tribble 2. SUNRISE: Cameron Burist 23, Taieem Comeaux 21, Marvin Coleman 18, Tahj Comeaux 16, Jorden Williams 12, Oscar Burns 6, De’Shawn Keperling 6, Zach Matlock 4, Kevin Legardy 2, Mory Souhamoro 2.